Birmingham defeated Chelsea in November - a sign of the Premier League's increased competitiveness? A quick glance at the top of the league table after 38 games could easily be interpreted as the “same old story”. The three richest clubs in the land occupy the top three league places, whilst the top two spots are held by teams who have shared the previous seven titles. Observers of the league will know it’s not been that straightforward. The division has rebranded itself as the most competitive and therefore most exciting league in the world, following a string of unpredictable results throughout the season. This season has already proved that England’s top flight has no equal as the most competitive and exciting league around. There can be no denying that Spanish football produces some unbelievable games… But 21 points separated Spain’s top two from third-placed Valencia and Real scored eight goals against the bottom club, Almeria, on Saturday, so La Liga lacks the unpredictability which makes the Premier League what it is. 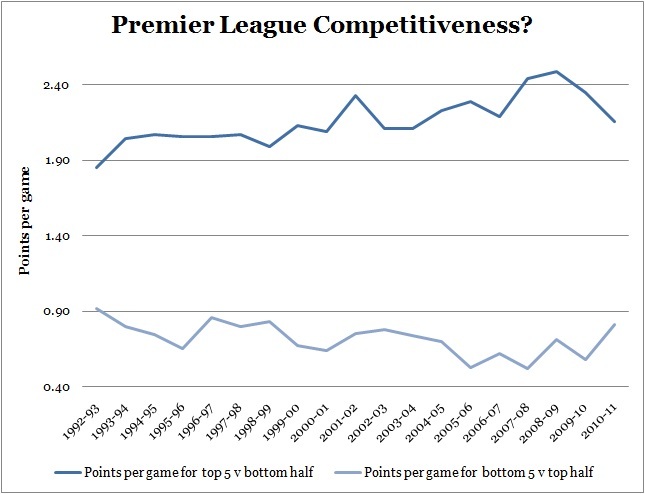 Hansen has fallen into the classic pundit’s trap of citing one example as overriding evidence of a universal point, but nevertheless the issue of competitiveness is worth exploring, particularly off the back of a number of suggestions that the Premier League is becoming increasingly competitive. I was keen to see how the very best clubs cope against weaker teams in the division, and how the very worst clubs cope against the stronger teams in the division. More precisely, for every Premier League season I’ve calculated the league’s top five-placed teams’ average points per game against teams that have finished in the bottom half. Equally, I’ve calculated the bottom five-placed sides’ points per game against teams that finished in the top half. The choice of five teams is purely arbitrary. The rationale is to observe how liable to upsets are teams at extreme ends of the table . As a Liverpool fan I’m also more than aware football did not begin in 1992, but the Premier League’s first season acts as an easy starting point. We should expect a decline in the points per game for the best clubs against teams in the bottom half, as they drop more points in matches you’d expect them to win, and vice versa for the worst clubs. Whilst year-on-year changes are probably insignificant, it is the trend that is important; and since 1992 the lines have diverged, indicating the league has steadily lost competitiveness. However, league predictability appears to have peaked in the seasons between 2007 and 2009. 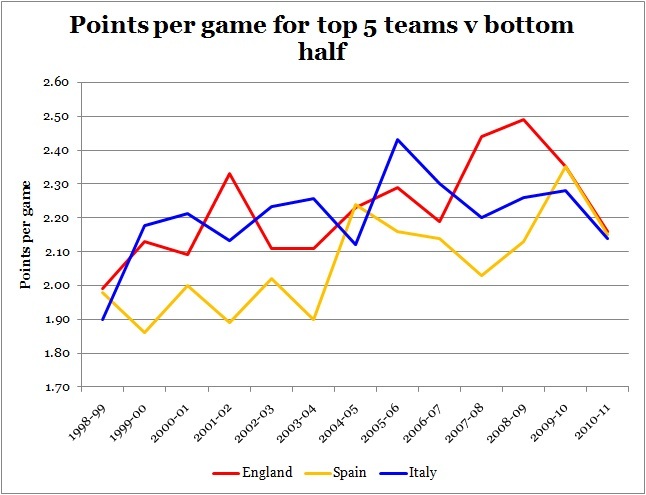 In particular points per game for top five sides against bottom half teams has fallen in consecutive seasons. Whether this is the start of a new trend remains to be seen, upcoming seasons will reveal a fuller picture. Either way, by this measure the league is still some way off its most competitive season: 1992-93, when Aston Villa, Norwich, Blackburn and QPR joined Manchester United in the top five. Remarkably, the points per game for the top clubs in 2010-11 are almost identical across the three leagues; 2.16 in England, 2.15 in Spain and 2.14 in Italy. All three leagues have shown a fall in competitiveness since 1998 in this respect, but there have been recent ‘kinks’ in the right direction. Somewhat bizarrely, despite the dominance of Barcelona and Real Madrid, the Spanish Primera Division has been consistently the most competitive league by this measure. This suggests that there has been plenty of upsets and unpredictability about the sides competing for the remaining European spots. At the bottom, the Primera Division has maintained a competitive advantage over its nearest rivals. Again, upward ‘kinks’ in recent seasons suggest that the downward trend in points per game may be coming to an end, but as before only time will tell. I must stress that this is only one measure of competitiveness, and by no means definitive. Neither is this post a comment on the quality of the three leagues. Clearly, league tables tell us that a duopoly exists at the top of Spain, but then again Manchester United’s title has been all but secure for a couple of months. It’s easy to forget that Barcelona lost to 19th-placed Hercules and Real Madrid to Sporting Gijon and Real Zaragoza (who finished 2 points off relegation), both at home. Not that I’ll rely on examples a la Hansen! Is there more scope for upsets in the Premier League than before? Probably. Is it the most competitive major league in the world? It all depends how you measure it. 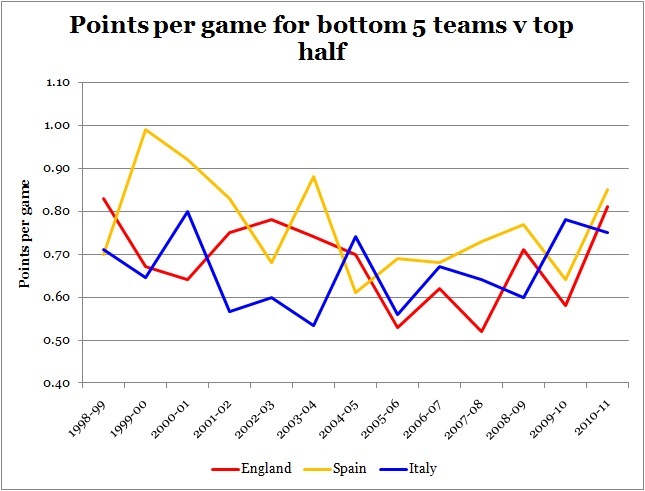 Points per game during the Calcipoli seasons have been calculated on the original points scored, before deductions. Do you think the Premier League will continue to become more competitive – and does Barcelona and Real Madrid’s dominance disguise a largely unpredictable Primera Division? Please provide your thoughts below. ← Has Premier League scheduling favoured Manchester United? A really interesting post, and a little discorncerting how the gap has grown between the “haves” (Top5) and “Have nots” over the last 12 years or so in all 3 leagues you’ve compared. I remember reading somewhere a while ago that the biggest influence over either a match result, or more likely the final league position, of teams was their annual wage bill. Transfers had some influence, but by far the biggest was the wage bill. Although regard the Prem League i’m thinking, with exception of ManC, perhaps transfer spending is of more influence. The gap in transfer spending does seem to have closed over last year or so – or my perception of this is it has, I have no factual evidence mind! Che definitely have gone less beserk prior to Jan11, ManU, Ars & Liv haven’t had the cash to spend. Also this season the decrease in points of Top5 vs Bottom half has been far more noticeable whne the Top5 team is away. Top5 between them have only lost 3 of this seasons combined 50 home games against bottom half. Yet on the road ManU only won 5 all season agaqinst the whole league. From a betting perspective if you’d gone on Betfair and Layed every Prem League away team when they were odds-on to win a match (which is only Top5) you’d have made a good profit in 2010-11 season. Whether spending has fallen or not (like you, I haven’t really looked at the figures closely), it probably will over the coming years with the UEFA FFP rules, though it may take more than 2-3 years because of the loopholes and allowances. Whether that means teams stay as they are, converge or diverge I’m not really sure though! As you said, it’s only one way of measuring competitiveness. To be honest I don’t really think using stats is a fair way to measure it. For example, Man Utd twice came from 2-0 down (to Blackpool then West Ham) to win 2-3. These sorts of games…I mean how often do you see that happening to Real Madrid or Barcelona? Very rarely I’d think. I’m not sure ‘competitiveness’ is an accurate measure. I don’t know. I think ‘entertainment’ is a better one and it’s fairly obvious to almost everyone that the Premiership offers more entertainment than any other league in world football. A fair point, but when you say “I’m not sure ‘competitiveness’ is an accurate measure” – of what exactly? Haha yes I didn’t really want to wade into that debate! Do you have any data for the Bundesliga? In the last 5 seasons there have been 4 different winners and at a glance, as I haven’t seen much more than the odd match highlights, I would say it is more competitive. Also, due to the performances of German teams in europe I believe Germany have gone above Italy in UEFA’s rankings, meaning the football is probably of a higher standard than most people realise – certainly more attacking than I realised! Also, this anyone can beat anyone nonsense spouted by certain pundits is really starting to grate on me! In the odd game there will be a shock win, but on the whole teams finish where their budget allows them to. I would be very surprised if this year’s top 6 didn’t finish 1-6 next year. You only have to look down a division to see a much more competitive league (though even that finished with the two highest net spenders, QPR and Norwich, in positions 1 and 2). I think German football might just be in the healthiest state of all the major European leagues, judging from everything I read about their finances, club structure and youth development. There is data on Germany – might add another chart or too when I get the time. And spot on, in August if you’d be asked to predict the top 8-9 teams (remembering Villa finished ninth! ), you’d probably have exactly what was the case in May, and very close position wise too. Is it the best league in the world? Depends on your definition of the word “best”. In terms of excitement and unpredictability, it’s not even the best league in England. Hi, interesting stuff, although you’re right ‘competitiveness’ is quite difficult to measure. It’s possible that the high octane approach of premier league clubs helps to give the impression of competitiveness! All those sliding tackles! Those of us old enough to remember football pre-premier league will know that most fans went into each season genuinely believing that their team could win the league. I don’t think that happens now, and a lot of fans are hoping to stay up or achieve mid-table mediocrity. You’re right, there is a lot of excitement about the EPL being more competitive this year, but in a way it has not really changed life at the top. I guess a truly competitive league would be more unpredictable in terms of the top four/five clubs come the end of the season. And for all the talk from pundits that it is more competitive I suspect most would pick the same 5 or 6 clubs to finish in the top 4 positions. It certainly feels like it has been more competitive this year, but I think this is because of a drop in quality from the top clubs (and perhaps an increase in quality from teams in the bottom half?). However, the result of this increase in competitiveness is merely that the top clubs have found it harder to pull away from the rest (as have barca and RM) – but it hasn’t actually stopped them from finishing ahead of everyone else. And I’m not sure when that will start happening, if ever, unless you have more clubs that adopt the Man City approach. Thanks again for an interesting read. Cheers. I agree it’s probably universally acknowledged the top teams are weaker than they were 2 years ago and that’s increased the likelihood of ‘freak’ results, but that doesn’t mean they’re commonplace. I mean, it doesn’t exactly explain United’s remarkable home form – as Steve pointed out above it’s the away form that’s changed a little. I did a few quick calculations, based on the statsitical measurement of points per game average difference. I took the top 3 and bottom 3 teams in each division (Serie A, BuLi, Premier, La Liga) and then added up points totals for each set and then divided them by games played to get average points per game. I then simply subtracted one from the other to get an average points earned difference. The smaller the number, the more competitive the league. From this the competitiveness order last season was 1. Prem, 2. BuLi, 3. Serie A, 4. La Liga. Top work – presumably that’s for the season just gone by? Makes me wonder what the ideal cut off is; it’s difficult because each league seems to have a different set and size of ‘top’ teams, and it’s all about gauging where these top teams are relative to the bottom. The gap in Spain would’ve been even larger had Deportivo not been relegated on 43 (!) points. Cheers for the comment though, interesting stuff. Enjoyed you blog/posting 5am – I love all this kind of stuff. For me competitiveness in a league is the idea that any team can beat any other. Though the cream may rise to the top over the course of a season, that giant-killings are always possible – and indeed occur – is what makes it compelling. Instinctively, however, it seems to me that judging the top teams’ performance against the whole bottom half averages away the upsets that you are looking for. Playing Devils advocate I would say that all you’ve shown is that “on average the teams at the bottom loose to the teams at the top” which we knew. “The league doens’t lie” as Hansen might say… I wonder if Often Partisan’s top vs. bottom 3 applies less smothing to the bumps we are looking for? Anyhow, you got me to thinking about the Elo rating system and how its used in football (http://en.wikipedia.org/wiki/World_Football_Elo_Ratings) and whether there is anything we can use here to try to understand competitveness, or “upsets”. Briefly, for each game, we calculate the probability of a team wining, based on past performance, with a slight uplift for home advantage. Points are then awarded/docked for winning/loosing depending on this probability and the score. A “bad” team will score more for beating a “good” team than another “bad” team, since the expectation of beating the “good” team was small compared the expectation of beating the other “bad” team. Thrashing another team also gets lots of points. I started with all teams on equal points, then ran through 2009/10 season to set up the inital points values for the season 2010/11. I made the heroic assumption that promoted teams should have the points gathered by the previous seasons relegated clubs. This isn’t perfect, but it was either that or a completely made up value. This may skew the results early in the season for promoted clubs. For lack of any proper work to do I then calculated the mean and standard deviation of the amount of points changing hands in each game, to get some sense of the distribution. Below I have shown those games in which the points change was over 2 sigma from the mean. According to this ratings system then, these are the most surprising results in each of the Prem, La Liga and Bundesliga. The first column in the tables is the probability of a home win. 2. The distribution in the premier league has the fatest tail suggesting the highest number of upsets of the three leagues. Dare I suggest it is the most competitive? 3. Roughly 1/3 of these games feature promoted teams which may be due to the initial values they are assigned. I’m no expert on Spanish football, but Hercules wining at the Nou Camp is probably the definition of an upset, and Newcastle beating Villa 6-0 was certainly unexpected. 4. Not shown above, but the dullest game (with fewest points changing hands) across the three leagues was Birmingham 1-1 Villa. That is sensational work! Do you have a website where that’s all laid out? Seems like a viable measure of competition to me, the only thing I’d point out – which some people have suggested about my analysis – is that it doesn’t account for matches like United’s comebacks at West Ham and Blackpool, but then again it’s very hard to cover so many bases. I think you’re right to an extent on my analysis, though since I’m looking at a time trend I was expecting, ‘on average’ the points totals to fall/rise for the top and bottom respectively – I was more trying to see if there’s a trend rather than the actual outcome of each period. Andy, I really like your analysis and am finding it hard to pick holes in it besides the one you already point out about promoted teams and those which are found in the Elo rating system. Just a couple questions, as I may look into this myself! For your second point, are you looking at the distribution of all point changes throughout the season or the distribution of the ratings of each team in the league at the end of the season? Do you have graphs for them? On your third point, have you found that the initial make-do ratings for promoted teams has skewed some of the other teams’ ratings at the beginning of the season? If so, perhaps we need to intervene on these initial fixtures or ratings using external information? On your fourth point, it’s not surprising that this is a draw given how the Elo system works, as a team who is very likely to win is also likely to win by more than a goal. I was wondering if you knew of any other systems which rate football (/sporting) teams in a similar way? This is interesting, but I’m skeptical of comparing the top teams with very bottom teams. Shouldn’t an evaluation of “competitiveness” take into account the teams in the upper-mid table more than those at the very bottom? It is the health and consistency of those teams over the full course of a season that really matter. Also, I agree with commenter Will above who suggests looking at comebacks (or, alternately, at least how often and by how much the top teams fell behind over the course of a season) would add depth to this analysis. The effort here is appreciated, but I think ultimately the comparison is flawed. Of course, I’m not a statistician. Cheers for the comment. I started the research on the oft-stated belief that ‘anyone can beat anyone’ in the Premier League – for me that implied the worst teams in the division could beat ‘anyone’ in the top half, and I went on from there. I do like the ‘coming from behind’ idea – will see if there’s any stats available on that. Ah, yes, well from that perspective it makes sense. “Anyone can beat anyone” is mostly an idiot pundit quip to fill earspace, though. How do, say, the 9-12 places fare against the top 4 in any of these leagues and what does that mean for that league’s overall health? Overall, having watched a load of Bundesliga games this season (to complement my usual EPL diet), I’d agree that league is the most competitive and consistently entertaining. This is a really well-thought out, erudite piece. I like how you appreciate that this is only one measure of competitiveness – most people show some graphs/stats and then immediately jump to a conclusion. It’s interesting to ponder what really makes a league competitive. Part of it must be the variation in league position of clubs over the course of many years, which would point to low competitiveness in EPL, and higher in the Bundesliga, I imagine. The top 4/5/6 vs bottom 4/5/6, which you use, is a pretty good one, it seems to me. As people say, there is a big difference between beating a team 8-0 and 3-2. I would love for you to have been in the MoTD studio and pointed out the things you have written to Hansen and seen his reaction. He probably would have resorted to shouting platitudes at you and fled the studio. Haha cheers, appreciate it! The variation of league positions is an interesting one – at the top in England it’d obviously be fairly low, but across the rest of the division it’s pretty high. Thinking of clubs like Fulham, Bolton, Sunderland who tend to move up and down the table in consecutive seasons. Recurring theme seems to be Bundesliga competition too – their football is in a really good place right now, by all accounts.